Two legendary book editors spanned the length of the 20th century: Maxwell Perkins at Scribner’s (1910-1947) and Robert Gottlieb at Simon and Schuster and Knopf (1955-present). A. Scott Berg’s award-winning Max Perkins: Editor of Genius (1978) led me to some of Perkins’s most famous authors such as Thomas Wolfe. I’m currently listening to Robert Gottlieb’s memoir Avid Reader: A Life (2016) narrated by Gottlieb himself. He arrived at Simon and Schuster in 1955, is still editing today, and turns 87 in April. He has famously edited the work of Robert Caro, Toni Morrison, John Cheever, Nora Ephron, Bill Clinton, Bob Dylan, and perhaps his most famous discovery, Joseph Heller, author of Catch-22. 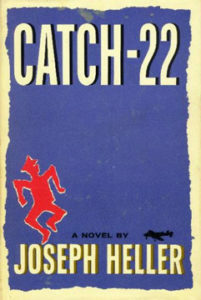 Gottlieb tells the story of how the novel was originally titled Catch-18 but was changed (at Gottlieb’s suggestion) to the more familiar title because of Leon Uris’s recently published Mila 18. The book appeared in 1961 and is considered one of the great novels of the 20th century. Never having read it, I picked up a copy and dove right in. The anti-hero is Yossarian, an Air Force bombardier who believes the real enemy is his own military, which keeps increasing the number of missions he must fly over Italy before he can go home. Heller knew of what he wrote, having flown 60 bomber missions during World War II, an ordeal that haunted him the rest of his life. 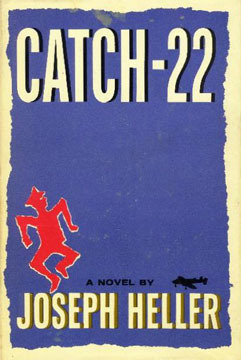 By turns hilariously funny and very dark, Catch-22 explores the tragic absurdities of war, a subject as old as The Iliad. Heller, by his own account, owes much to Jaroslav Hasek’s absurdist war novel The Good Soldier Svejk: And His Fortunes in the World War (1921-23). Critics were mixed, but readers raved, and it created a cult following, complete with “Yossarian Lives!” bumper stickers. Harper Lee called it “the only war novel I’ve ever read that made any sense.” Nominated for the National Book Award, it lost to Walker Percy’s The Moviegoer. I’ve avoided Mike Nichols 1970 movie adaptation till I finish the book, and am looking forward to the forthcoming 6-part Hulu miniseries produced and directed by and starring George Clooney. Stoicism in the face of absurdity, as necessary now as then. Yossarian still lives. This entry was posted in Books, Culture, Movies, People on March 20, 2018 by Stan Deaton.